Navigational (10-26%): when users search for a specific website (eg, ‘cambridge uni wiki’). Transactional (10-24%): when the users search with the intent to complete a transaction (eg, to renew a book). Informational (48-80%): when users search for information on a given topic. This type of query often precedes a transactional query. If you improve the SEO but not the usability of the page, you’ll increase operational costs because people will phone instead. The most effective approach is to improve both SEO and usability (search usability). Good website usability is not the same as people saying they like or use your site. Focus group opinions beat little resemblance to actual behaviours exhibited during usability tests. Because they do not wish to appear stupid in front of a group, people downplay problems and issued with a site. People are not always objective when evaluating their own behaviour. People cannot use what they cannot find. SEO professionals help make content easy to find via the commercial web search engines. 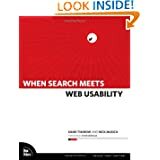 Usability professionals help make content easy to find on a website. The string that connects these two groups is the scent of information. People need the scent of information in order to locate and discover desired content. The scent of information consists of graphical and textual cues that facilitate navigation (where can I go? ), orientation (where am I? ), and assessment of content value (should I click this link?). According to Gestalt Principles of Visual Organisation, items placed close to each other are associated with each other. This is called the Principle of Proximity. Website usability is task oriented. Through usability testing, usability professionals measure how well users can accomplish specific tasks with efficiency and a high level of satisfaction. Website usability is about effectiveness, efficiency, learnability, memorability, error prevention, and satisfaction. It is not a set of focus group opinions. Calls to customer service ratio: this is the ratio of the number of site visits to calls a website can expect to receive. 15% is considered a reasonable ratio. You can determine the visit to call ratio of your website by putting a unique customer service or call centre number on the website. Track the number of calls that come through the unique number and compare them to the visits your website is receiving to determine your visit to call ratio. Call centres and customer service centres use average handle time (AHT) as a metric to measure the average duration of a transaction made over the phone. AHT includes hold time, talk time, and necessary tasks that follow the transaction. AHT is a driving metric when projecting call centre staffing levels. Write in a journalistic style, using inverted pyramid with the most important information at the top of the page and above the fold. Use short paragraphs, two or three sentences each, similar to newspaper paragraphs. To aid scanning, consider using a header for every two or three short paragraphs, and for every paragraph longer than five to seven sentences. Mis paragraphs with long, short and medium-lenght sentences. Keep within a 20-word maximum for a sentence. Use bullets in lieu of paragraphs to help users scan content. Use numbered steps if you are writing instructions, such as recipes for cooking. Present information to users in snack sizes. Avoid serving up large portions of text. get to the point with your copy. Avoid using overblown excessive hype. Make body copy hyprtext about 7 to 12 words long. The more users are forced to muddle through your website not finding what they are looking for, the more your website communicates a negative brand experience. It may be your website, but it is your users’ experience. Treat your users with respect and they will treat you well.